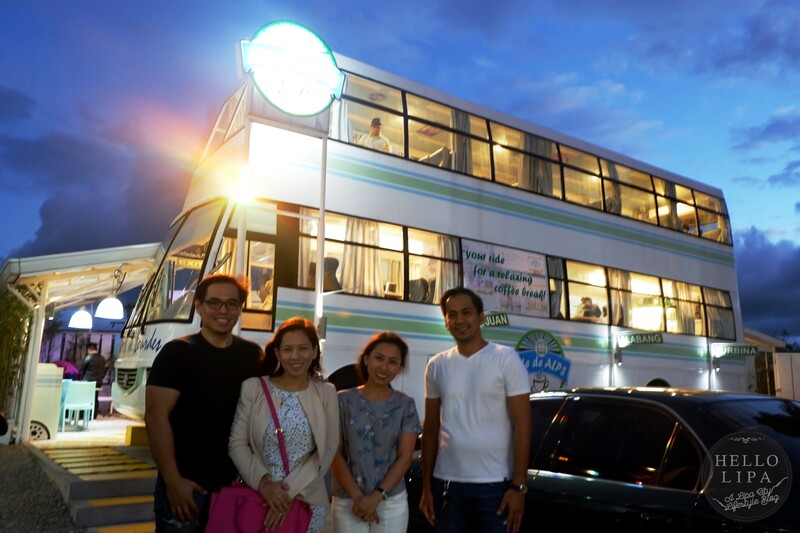 There’s an Alps bus parked at the Caltex station along Ayala Highway right beside Lipa Medix. Here’s the thing. It’s not actually going to physically drive you someplace else, although it’s a bus that runs perfectly. It’s not a traveling bus anymore. 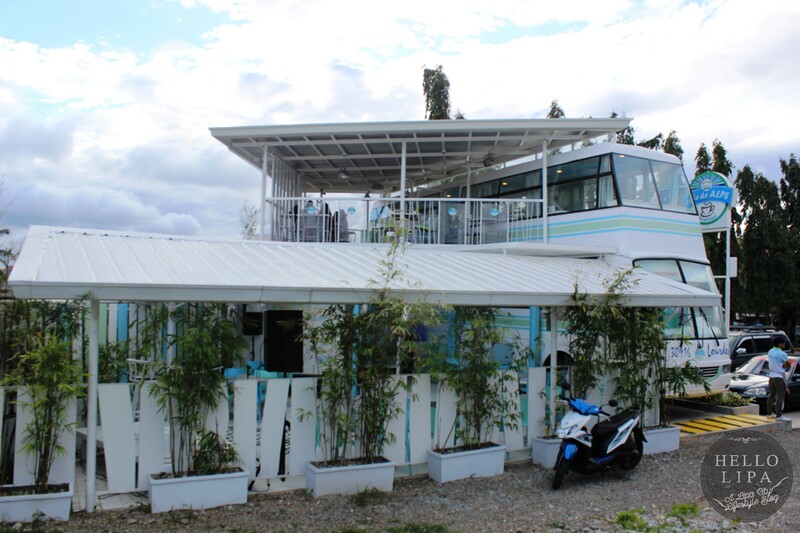 It’s been fitted with equipment and fixtures and is now a restaurant café. Ladies and gentlemen, get on Café de Alps. 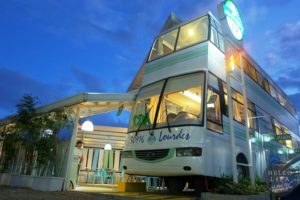 Café de Alps is the very first bus-themed café in the province of Batangas. Originally located at Metro Events Zone, they moved to a new location at the Caltex gas station along Ayala Highway to better cater to their target market of groups of friends and families looking for a relaxing place where they can bond, enjoy good food and drinks, and basically just have a good time. 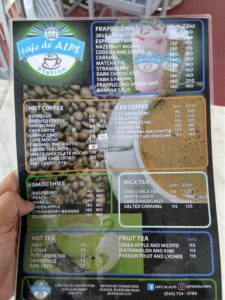 Cafe de Alps in its new Lipa City location. 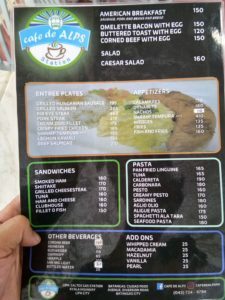 Café de Alps is owned by Ms. Tara Denisse Perez Cleofe. 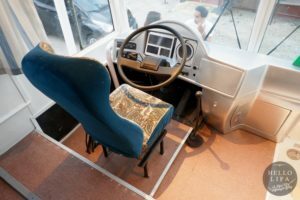 Her family owns the Alps bus line and instead of directly working for the family business, she decided to venture out to something that fits her skillset and passion better. 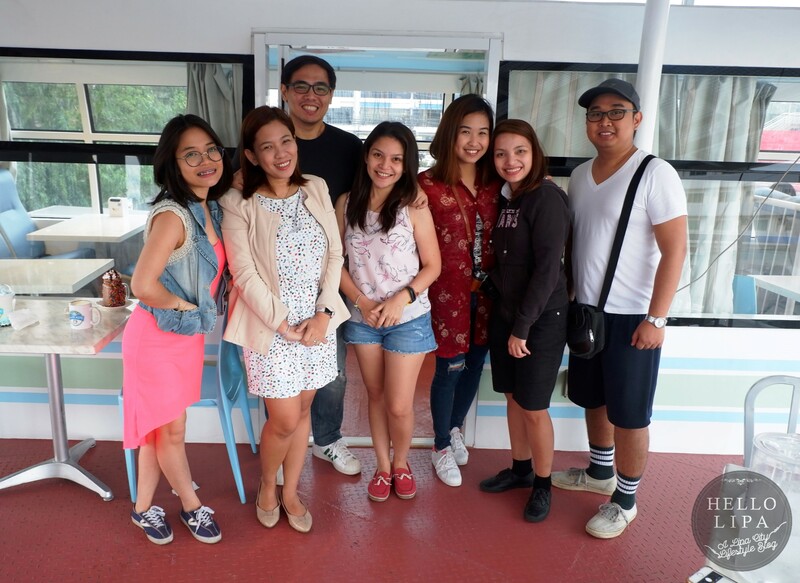 From L to R: Hello Lipa’s Jay Recinto, Aisha Recinto, Cafe de Alps’ Tara Denisse Perez Cleofe and Gholem De Castro. Looking at their 15+ year old buses that are sidelined because of the phase-out initiated by the LTFRB and with the guidance of general manager Gholem De Castro, they decided to turn one of their buses into a café. 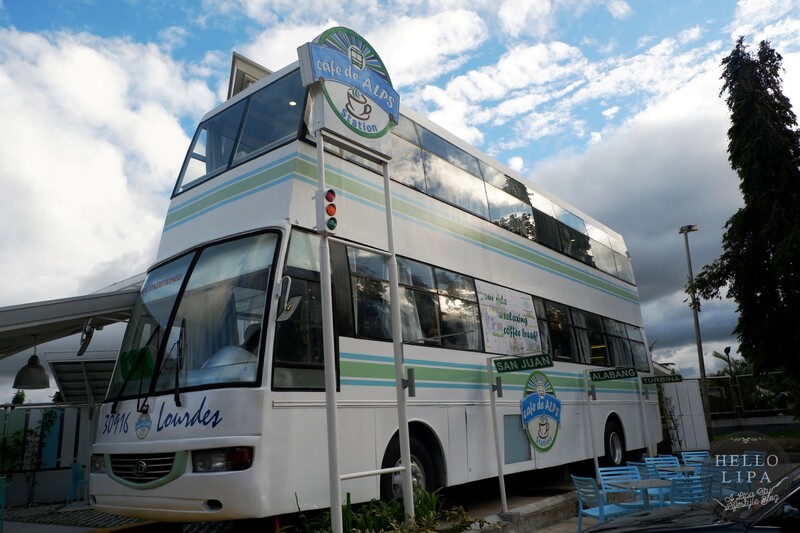 The mere fact that it’s a bus turned into a café makes it worthy of making it in your IG feed (make sure to use #CafedeALPS). Once you’ve laid eyes on the whole café, you’d find yourself signing up for data because you won’t be able to wait to post pictures of the bus. Cafe de Alps at night. My jaw dropped when I saw what was hiding at the side of the bus. 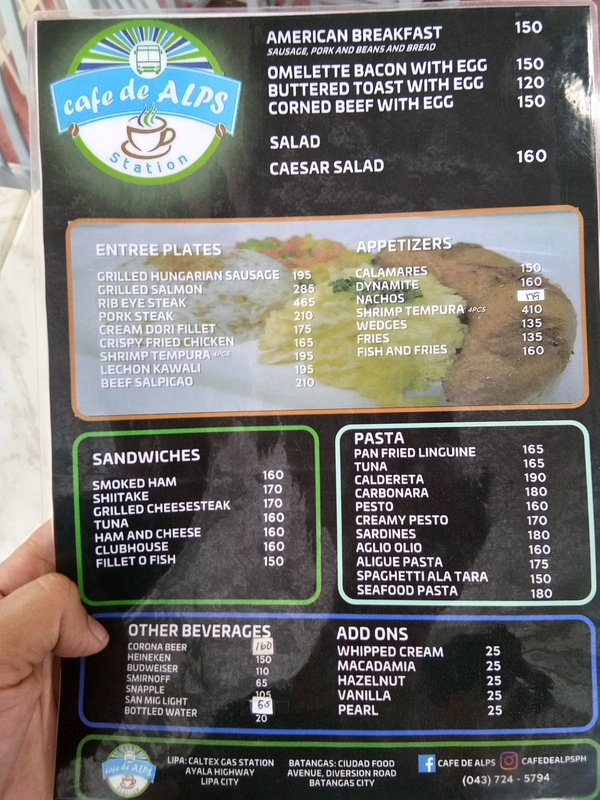 I actually thought that the bus is the whole café. It turned out that there are tables and chairs set up outside. 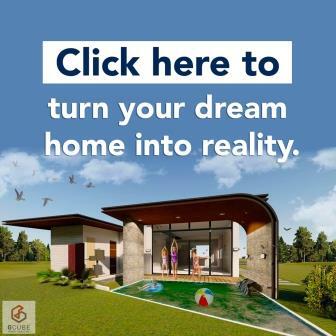 The extension part is perfect if you want to watch live bands perform. Yes, they have bands playing regularly. Judging from the band that night, the invited bands are good. This is something that you don’t see from the highway. 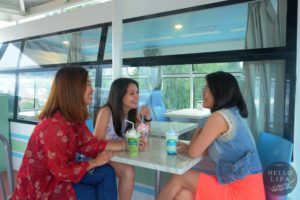 This extended area at the 2nd level of the bus is perfect if you like to look out at the horizon while enjoying your food and drinks. You can also look down to watch the performers. I love how they turned every nook and cranny of the bus into something that’s worthy of getting pictured. You’ll actually forget that you’re inside a bus, until you see this. Even the driver’s seat is a prime location for your IG Stories. You’d probably spend a good 15 minutes just looking around and taking pictures especially if it’s your first time. Now, on to the food and drinks! This bus doesn’t have vendors serving itlog ng pugo and nilagang mani. What they do have are trained “Kundoktors” cooking and serving good food like what you’d expect from a full service restaurant. 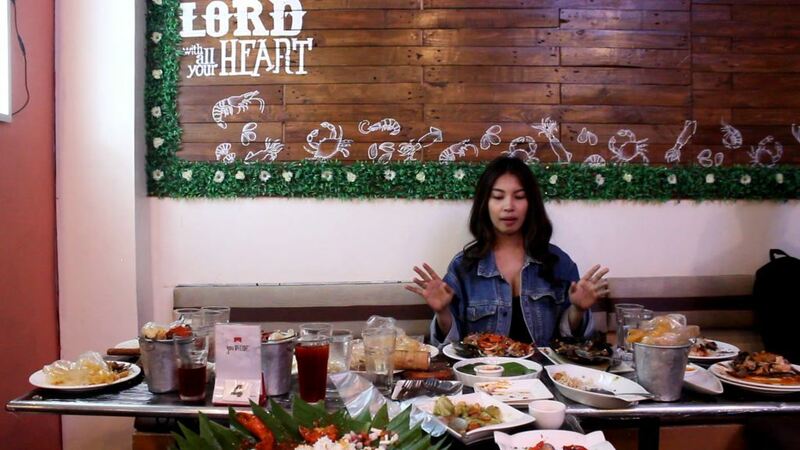 They have appetizers (or pulutan depends on who you ask). They have Buffalo Wings. 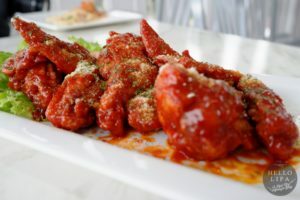 I love their version of the Buffalo Wings. 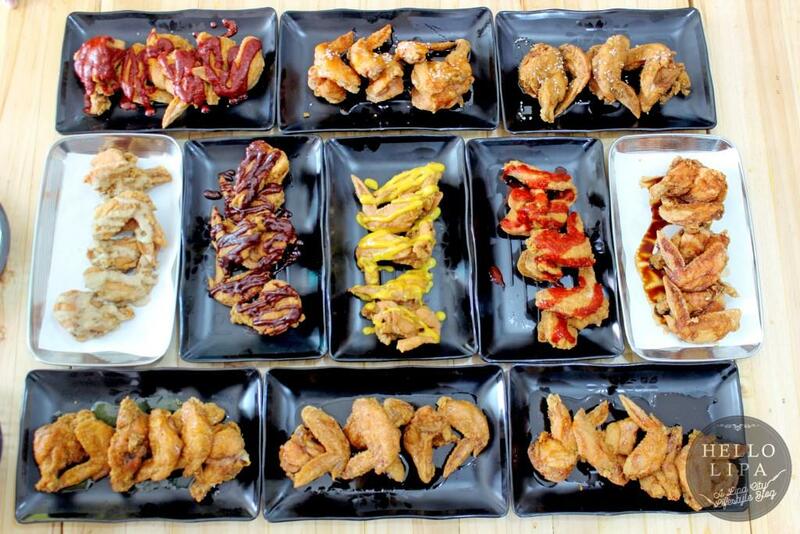 The wings are slightly spicy and tangy. They also served us Pork Sisig. 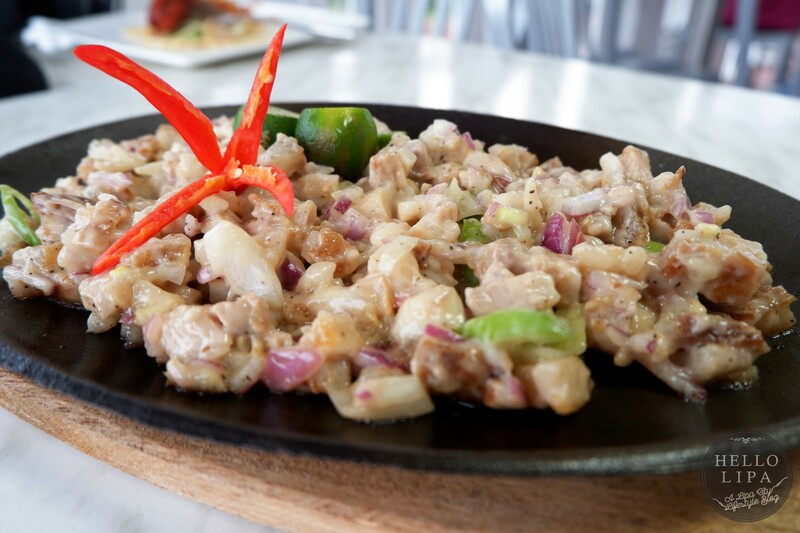 As you can probably see, the crunchy pork sisig is also creamy. This goes well with rice or a cold one depending on what time of the day it is. They have a solid lineup of all-day breakfast fares. 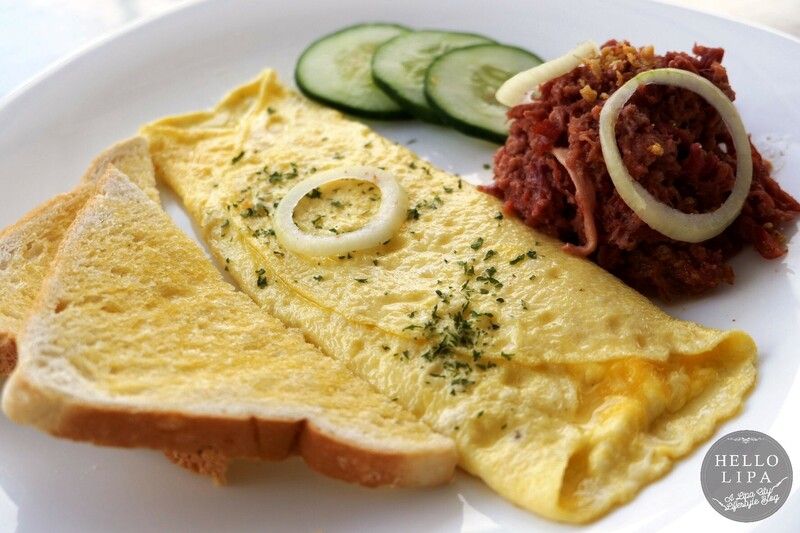 There’s the Corned Beef and Egg dish. The omelet was cooked just like how I want it – creamy on the inside. The corned beef goes well with the bread. The tocino is perfectly cooked (not too dry). The eggs are beautiful and perfectly seasoned. The fried rice is garlicky. The Hungarian Sausage is a favorite of mine. The sausage is fried to perfection. It’s a little crunchy on the outside and juicy on the inside. 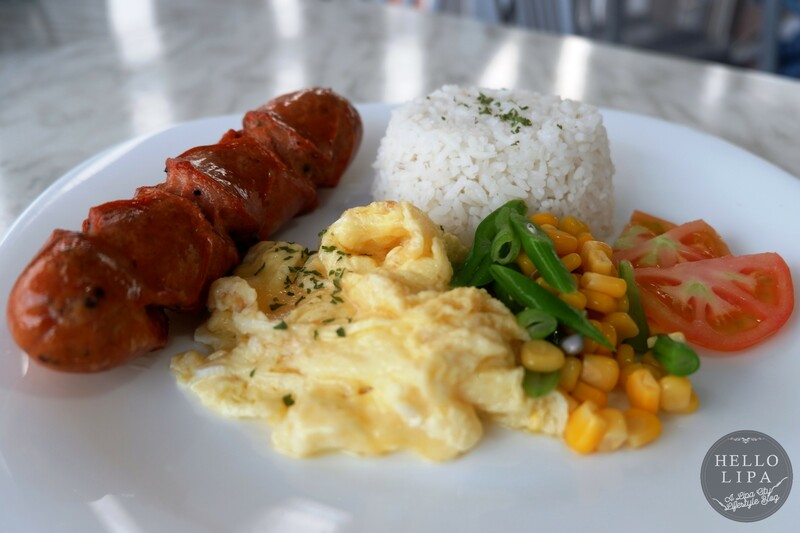 The scrambled eggs are also creamy just like the omelet. They also have sandwiches. 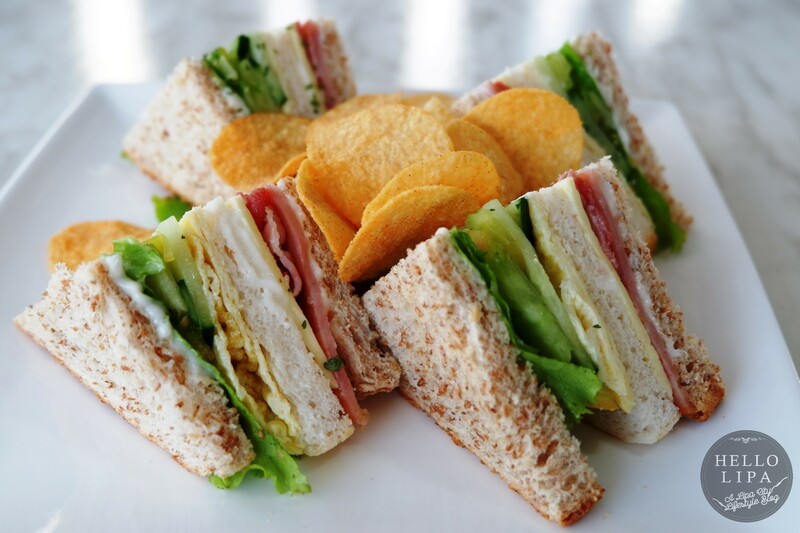 Their Clubhouse Sandwich lights the club up. I love the fact that they use whole wheat bread. Its health benefits complement the greens in this sandwich, which makes you forget that you’re enjoying this delicious and healthy sandwich with crispy chips. They also serve pasta! 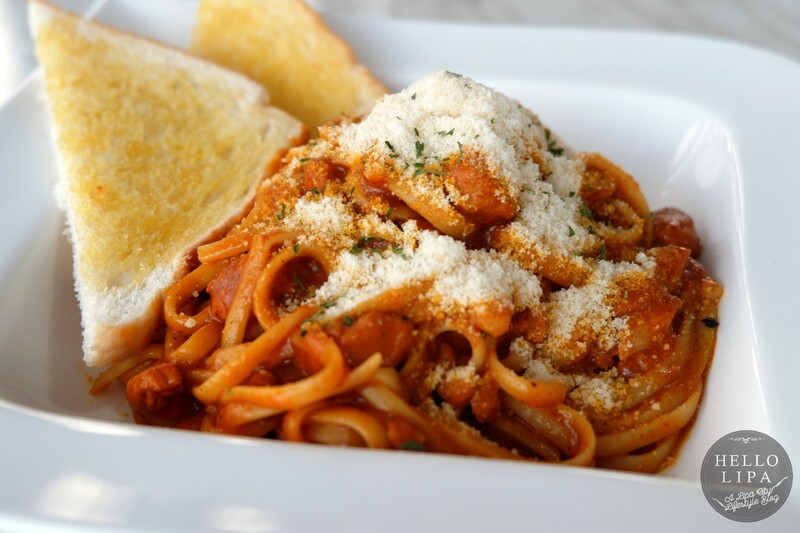 I’ve heard great things about the Caldereta Pasta. I now know why this is a favorite of regulars. This is highly-recommended. For kids and the kids-at-heart, you can try the Kiddie Meal. 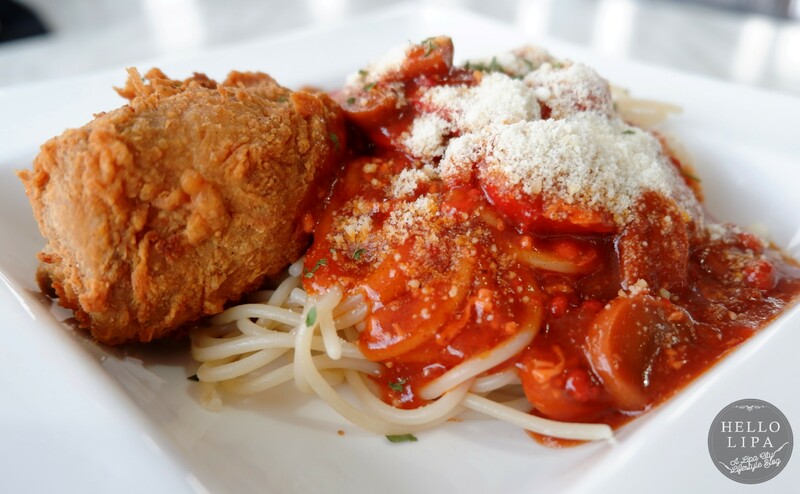 The sweet style spaghetti complements the crunchy and savory fried chicken. My favorite among the pasta dishes is the Pan-fried Linguini. This has everything that I’m looking for in a dish. 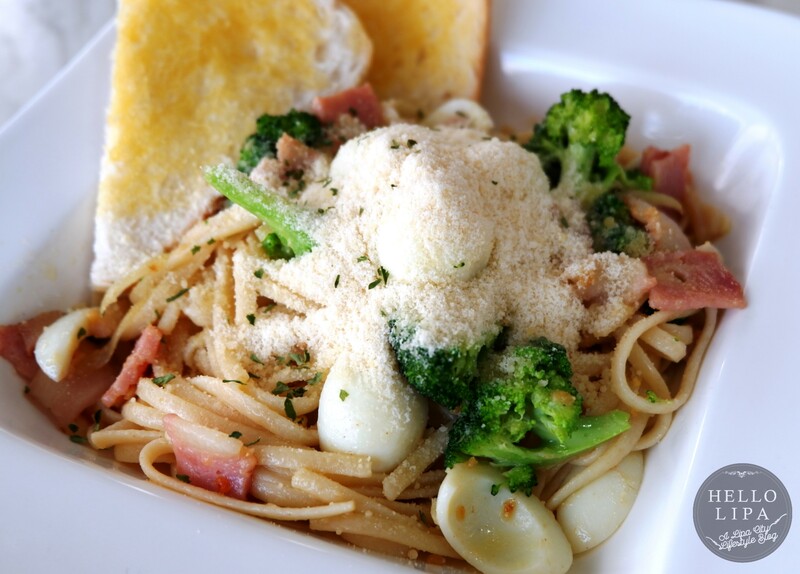 The linguini is heavy and filling. 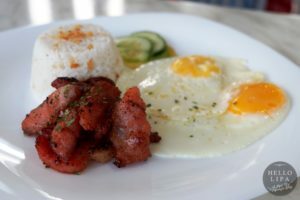 It has a good amount of protein provided by bacon and quail eggs. The broccoli provides a nice contrast in color and flavor. The generous topping of cheese levels it up even further. As you can see from their lineup of food, just about anyone can enjoy a meal at Café de Alps. This is why they’re very popular among families and groups of friends. Even the young ones can have their fill. In fact according to Gholem, it’s not unusual for families in their pajamas to drop by for a pre-bed snack. They have an impressive and colorful lineup of Frappuccino, Smoothies and Club Soda. You’ll find yourself spending a lot of time taking pictures of them and no one will blame you. 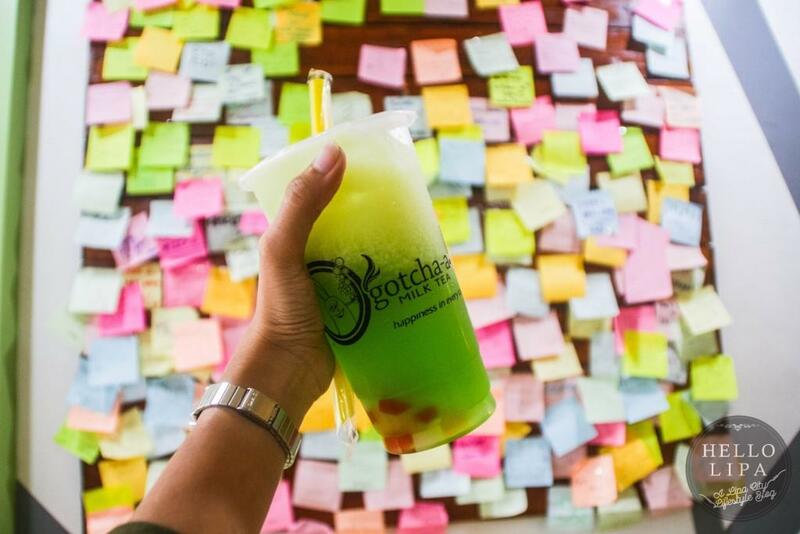 Take one sip and you’ll find out that they’re more delicious than they look. With how beautiful they are, that’s saying a lot. Nowadays when the weather is in their low 20s, you’ll love their hot coffee drinks. The Café Mocha is good, but the Cheesecake Latte is better. Get on the Bus Today! 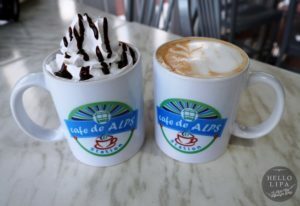 Get on Café de Alps today! Its destination – Food Paradise – is something to look forward to, but the station is an experience in itself. It’s one of those places that offer the complete experience – from its unique and beautiful interior and exterior to great food and drinks. 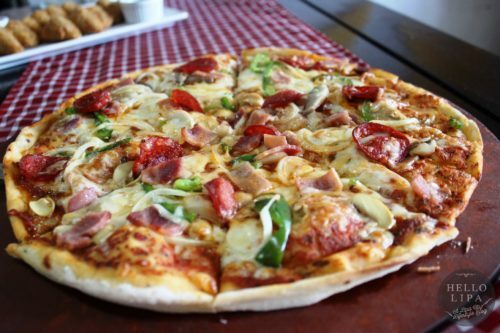 So gather the family and friends and punch a ticket to Food Paradise!